Hi, I'm Chris Hallbeck the creator of Maximumble, Minimumble and The Book of Biff. If you've never used Patreon before check out this 1 minute video. Access to my Patreon stream with sketches and notes as I work on comics with exclusive behind the scenes videos. You get to see future comics the moment I finish them! 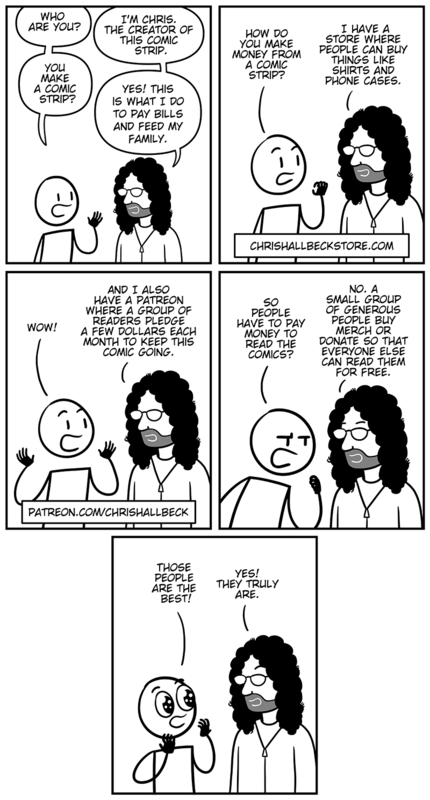 And you get Patreon exclusive bonus panels for every new comic! Plus I will send you a high-res digital file (suitable for printing) of a Maximumble or Minimumble comic of your choice. You can select one of my ebooks for free. You get to see exclusive videos. You get access to my Patreon stream with sketches and notes as I work on comics. You get will get access to brand new never before seen comics! I will send you a high-res digital file (suitable for printing) of a Maximumble or Minimumble comic of your choice. You get to see future comics. I will send you all of my ebooks for free! Brand new Patreon exclusive comics. I will follow you on social media! While pledging at this level I will follow you on Twitter and Instagram. I'll see your tweets and posts and leave comments and likes on the ones that I genuinely like!